The purity and integrity of Molissa Fenley's solo dancing and choreography, with her adventurous exploration of contemporary music, came to the fore with her three premieres on Saturday night at the Joyce Theater. To say she single-handedly raised the level of the Altogether Different series, which ends next Sunday, is an understatement. It is just as obvious that her search for a contemplative form of dance with an increasingly reductive idiom demands a certain empathy from the viewer. "Threshold" and "Place," the newest pieces, have the virtue of reaching the audience through the power of their concentration. "Threshold" can be felt as a danced meditation, a sequel to "Bardo," the 1990 solo with a Tibetan inspiration that Miss Fenley created to music by Somei Satoh. "Toki no Mon," another score by the composer, who stood up for a deserved bow, was played live by Kate Light on the violin, Martin Goldray on the piano and Frank Cassara on gongs and steel drums. Miss Fenley inhabits a similar silence in her trajectory, breaking her recurrent stillness with re-energizing spurts of jogs and hops or turns. Suggestions of mudra, the mime gestures of Indian classical dance, and tai chi movement from China, reinforce the solo's aura of mental discipline and purification expressed through physical shape. Miss Fenley's clear silhoutte, hip out and arms in various curves over her head or at chest level, are more dynamically expressed to a tape of a score by Arvo Part in "Place." The Estonian-born composer specified that passages from Genesis be read during the score, "Sarah was 90 years old." The choreography does not refer to the idea that Sarah, at the age of 90, bore Abraham a son, Isaac. But the ecstatic dance toward the end matches the exultation of the score. Up to that point Miss Fenley has matched the alternating repetitive phrases of four drumbeats and wordless vocalizing with ritualistic circles. Her vocabulary favors plies and clear shapes with raised knees. The dynamism increases and accelerates as a female voice rises to signal the birth in the implicit text. Miss Fenley suggests, with hands held fleetingly in prayer position, an unexpected epiphany. 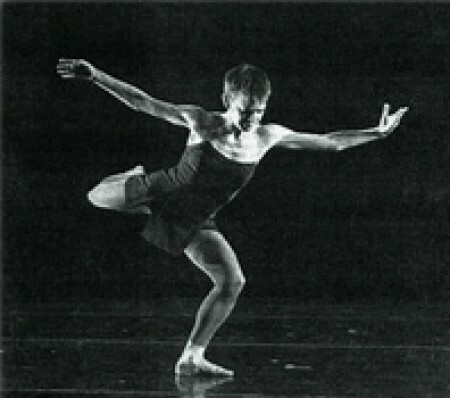 The local premiere of "Inner Enchantments," created for Peggy Baker, a dancer with a sturdier physique, did not quite fit Miss Fenley's mix of animal-like alertness and fragility. Phillip Glass's "Music in 12 Parts, Part 1" churned rather than chugged and took the solo, with its gnarled balletic silhouettes, nowhere in particular. David Moodey did the fine lighting. Archeology in Reverse full loop from Molissa Fenley on Vimeo.